It doesn’t matter what city you live in or what gym you go to. 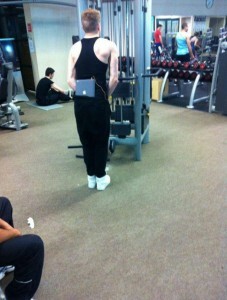 The typical male/female stereotype can be seen at just about any gym. For me, I used to go to the 24 Hour fitness in West Hollywood. Let’s just say the guys at this gym were exact replica’s of the guys in this video… occupying most of their time looking at their asses, dancing or chatting at very high volumes. I recently switched to Equinox in West Hollywood which falls at an arm distance from this video, except you can throw in women working out with their Chanel handbags and guys who’s arms look as if they are just about ready to explode. It’s a good look no doubt. #1. The Victoria Secret Fashion Show is tonight. We all know we will watch and immediately regret having eaten for the past 3 months. #2. We’re moving into our favorite yet worst season of the year. Whatever it takes to get you fit and active during this season do it. You can’t put a price tag on a healthy, lean body. Hence why I recently started making major sacrifices to enroll at Equinox. It’s a pretty penny, but if it get’s you there in the morning, it is well worth it!